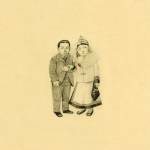 Will a major label agreement kill the charm of the Decemberists? 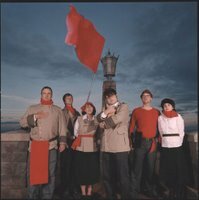 I think many Decemberists fans were wondering that when it was announced that the charming folksy Oregon band were signing with a major label for the release of their new cd, The Crane Wife. The strength of the Decemberists has always been found in Colin Meloy's ability to translate historical references into compelling stories, stories filled with rogues and rascals, pirates and prostitutes, mariners and marauders. The Crane Wife moves into new musical areas for the Decemberists, bringing in a more exerimental sound in many of the tracks. The lush grandiose opuses are still there in all their glory, with not one, but two of the songs clocking in at over 11 minutes. The Island: Come and See - The Landlord's Daughter - You'll Not Feel the Drowning is a song cycle of sorts, three distinct songs melded into one piece. As Rewriteable Content so aptly stated in their review of this cd, the Crane Wife has the potential to alienate a lot of die-hard Decemberists' fans, those who only want to hear the Mariner's Revenge Song again. This cd delves into more exploratory music and while that may seem like sacrilege to those who only want to hear another sea shanty, I say let's embrace a band's desire to explore and to push their musical boundaries. Hell, even Belle and Sebastian dipped into electronica with Electronic Renaissance. That said, I have to say that the Perfect Crime #2 does not really work for me. Something about Colin Meloy's voice does not lend itself very kindly to reverb and the overlong denouement of "it was the perfect, the perfect, the perfect, the perfect, the perfect, the perfect, the perfect, the perfect crime" seems forced, to say the least. That said, I have fallen completely in love with several of the songs and, in typical deviant Decemberists' fashion, I can feel the others starting to wrap a tentacle firmly around my heart. The Crane Wife will be spending a lot of time on my playlist. I love this CD!!! Great review Barbara. I am dying to hear their older stuff! This is on my list of cds to buy next weekend. Your review painted an excellent picture of what I have to look forward too! Woohoo!!! I made quote of the day *little happy dance*!!!!! I'm gonna print it out and stick it on my fridge. I loved both of those clips. Gonna have to get me that CD. Great review Barb, I love songs that tell a proper story, especially those concerning pirates and marauders. I bought the CD yesterday Barbara. I'm excited because this album has had some immense reviews. Pirates and marauders ? Last band I remember singing about them were Adam & The Ants. You were lucky to have heard leaks of this weren't you, Mel? Their older stuff is fantastic, especially last year's Picaresque. Mamma Bolt also suggested that I should ask you to be my friend, Allison (I always thought you were quite friendly), but you have to admire how she makes sure all her kids play together nicely. What else is on your must buy list? I meant to ask your permission first, Kees, but then I wanted to use it right away - no time to ask - because it was so good. Obviously you have no issues with me stealing your words. It's a grand cd and it will fit right in with the Nick Cave types. Adam and the Ants - are they different from Adam Ant? I don't think I know them. Other buys, the new k-os record (I think I'm seeing him in concert next week too), and searching for the Guillemots latest, so I don't have to buy it on Amazon. Also replacing the latest Dears, as I just broke it last week. Really need to clean my room so I don't step on things. Sounds like a grand list, Allison. You really broke your Dears cd by stepping on it? Ouch! That's a painful cd purchase then. I was just listening to Guillemots at Will and Ben's (and voted for the song). I'd love to hear how the K-Os concert is; I'm going to see the New Pornos with Novillero, and I think Immaculate Machine (about whom I know nothing) is opening. I am very lucky Barbara! Imagine how bewildered I was when I visited The Decemberists website, and the CD wasn't listed on the discography. I couldn't figure it out for the life of me ha, how dense eh? *G* Anyways, it is really amazing, and I will try to get the CD Picaresque :) Thanks for the recommendation! Now joining the bandwagon :) Wow, I have got to say I love your style Barbara. I left you an anon post on your winning against the office depot blog, and I have gotten hooked on your blog! I will introduce myself - my name is Steffi, and I am a child and youth worker in Ottawa. No, Mel, I would be totally bamboozled as well. Ooo, that's my new favourite word, I think. Picaresque is really really good. Awww thanks, Steffi! I do remember the comment you left on the Office Depot thing - that was so sweet. Well now that I know your name, I am able to welcome you properly, so welcome, Stef! That CBC interview was so fun, but also a little weird because I cleaned the entire house in anticipation of the John Spittal's visit, with the exception of the office, and guess where we did the interview? Yup, the filthy room. grrr. Yeah Barbara, Adam & the Ants were the band that Adam Ant left to go solo. They sang songs about dandy highwaymen and a song called "Hoist The Jolly Roger". It wasn't great actually, but then neither was Adam. You are a wealth of information, Ben! There seems to always be that fear, but thankfully we seem to be moving into an era where you can negotiate a contract on your terms. It seems they got this one out rather quickly. I really do like them, and hope I'll get to give this a listen some time in the very near future. I'll have to work on a rap about Mr. Meloy. I almost bought this CD and the Weakerthans at HMV...another day...I am not made of money, LOL! I am in process of getting your cd ready. My computer hates these Memorex discs. I am not going to by them again! The Sony ones seem to work much better. My computer is tired of doing this process so often! I know what you mean, Serah. Far too much of my disposable income goes to cds. Which is why I don't feel too badly about borrowing them from the library occasionally. If I like it, I will end up buying it anyway. But the Weakerthans! My boys! Which cd did you have to pass up? And I've got the track list pretty much ready for the Victory cd, but am waiting until I actually get the refund before I start making them - no point in jinxing myself. Well, now I want to get the cd even more. I've heard "O Valencia", and I liked it (Unfortunatly, I'm not gonna risk listening to your tracks, because of fear my computer will shut down). I'd probably buy Crane Wife anyways, considering how much I lovvveed their last album. Still, great review, now I definitely know to pick it up. Is your computer being persnickety, Hilary? I hate that! If you liked Picaresque and I know you did, you'll like the Crane Wife. I d/l'ed Picaresque yesterday and listening to it now. OMG it is so GOOD!! *singin "la de da de da de di da di daaaaah" * heehee. I will def buy it when I can!!! Oh those anchorpersons on tv! I've got to hear that song now. In fact I think I'll listen to the whole album. 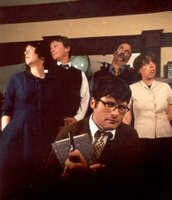 That's so funny - I happened across the new Decemberists' cd on Amazon today and I noticed it's in the top 20 or so - selling well, I see - Well done! Anyway, LOVE that cover, and I thought of you when I saw whose cd the cover belonged to. I'm really glad to hear the Crane Wife is selling well, PF. 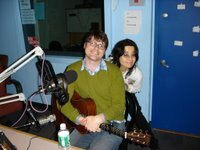 The Decemberists are such a wonderful band and are such sweethearts that I want them to do really well. They deserve it.